In an attempt to show the modern, more tolerant face of the Catholic Church, the Vatican today announced that Pope Francis would be the new vocalist for the death metal band Ghost B.C. 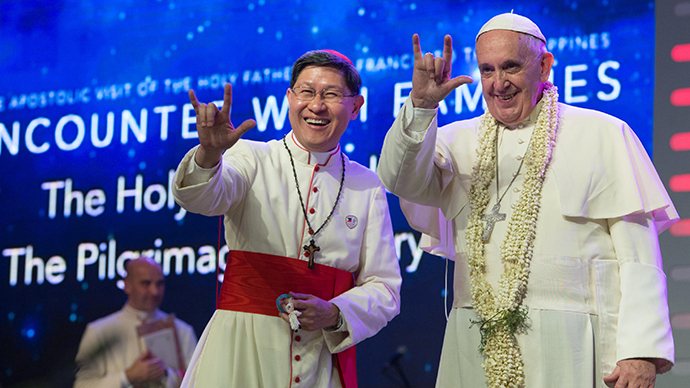 Pope Francis, whose only previous credit on an album come from singing backup vocals on the Annihilator song “Kraf Dinner”, has publically spoken about the “healing and transformative powers of heavy metal music”, but few expected him to actually appear on a metal album. Ghost B.C. 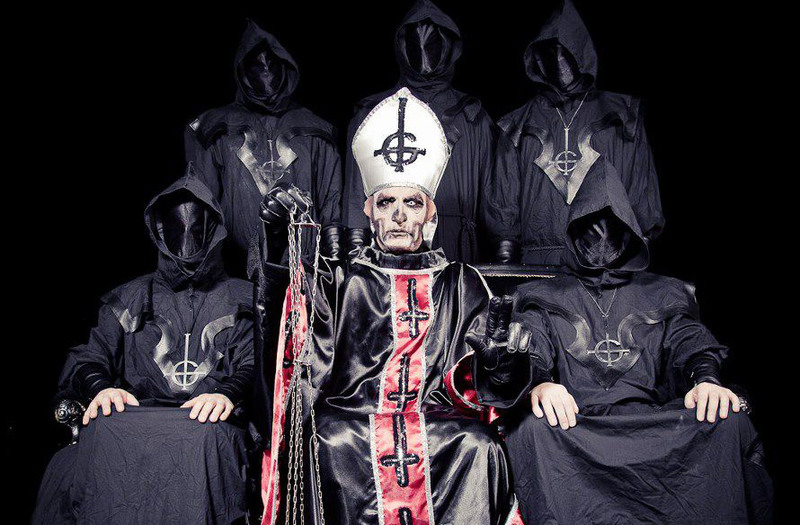 had initially planned to replace current vocalist Papa Emeritus II with a shadowy figure known only as Papa Emeritus III, but when the Vatican reached out and appealed to band to bring the Pope on board in order to bring harmony between “Catholics and hellbound non-believing scum”, the band immediately jumped at the opportunity. Pope Francis will be introduced as the singer during Sweden’s Hellfest in June. Pope Francis has distinguished himself in the past by making statements that reflect tolerance towards other faiths and acceptance of people who disagree with the Catholic lifestyle. While beliefs of this sort were thought of as the gateway to eternal damnation by his predecessors, they have helped improve the image of The Church among non-Catholics who are blissfully unaware of what The Church actually thinks about them. In a recent ABC News/Hormel Meat Corporation Poll, 63 percent of respondents said they believed they would “be very surprised” if the church began torturing and murdering non-believers as it has done throughout much of its past. This Pope, whose trademark catch phrase “What the Hell do I know, I’m just the Pope?” has become a rallying cry for Catholics around the world who long to become tolerant of the people that they feel an instinctive hatred towards, seems to be doing everything within his power to remind people that The Church is much more than the largest Ponzi scam in human history. He has reached out to Muslims, Jews, sexual deviants and those being punished by God with a life of poverty. Still, the past two singers of Ghost B.C. have been described as a “Satanic anti-Popes”. What could a Pope, who represents an organization that stands firmly against satanic rituals like birth control, abortion and homosexuality, possibly have in common with the band’s previous singers? 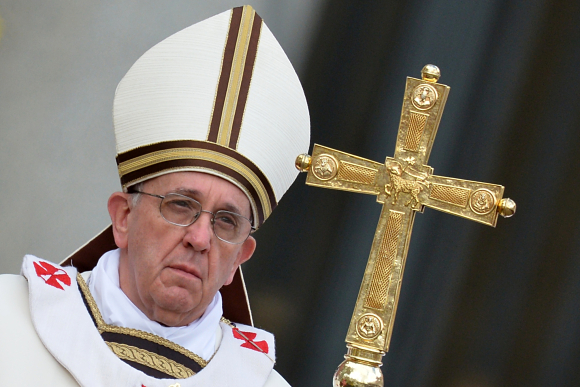 “Well, they all wear funny hats,” quipped Vatican spokesman Tom Torquemada. The new Ghost B.C. album “Turning The Cross Upside Down” is due out in August. For years, the biggest mystery in heavy metal has been the identity of Ghost vocalist Papa Emeritus. 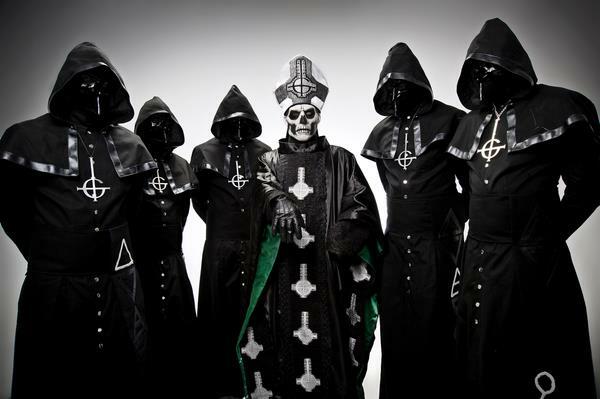 Ghost burst upon the scene in 2010 to rave reviews from metal fans everywhere (including an endorsement from one-time Presidential candidate Sarah Palin). However, up until this point the band has been highly guarded about their identity, never appearing without their trademark corpse paint and hoods in public and forcing interviewers to be blindfolded and driven seven hours to a cave in an undisclosed part of New Mexico to do interviews. However, our staff of investigative reporters at Tyranny of Tradition have uncovered exclusive documents proving, without a shadow of a doubt, that Ghost’s enigmatic front man is actually former Geto Boys rap sensation Bushwick Bill. The documents, which were passed to one of our reporters in an underground garage by a high level government official who went by the fictional name “John Holmes”, show tax returns filed by the band for the past two years along with handwriting samples from checks supposedly written by Papa Emeritus that, when analyzed by the CIA, appear to have been signed by Bushwick Bill. Included with these documents was a DNA sample taken off of Papa Emeritus’ fake Pope hat by FBI agents while it was at a dry cleaners in Provo, Utah that is close to matching the DNA of the rapper. 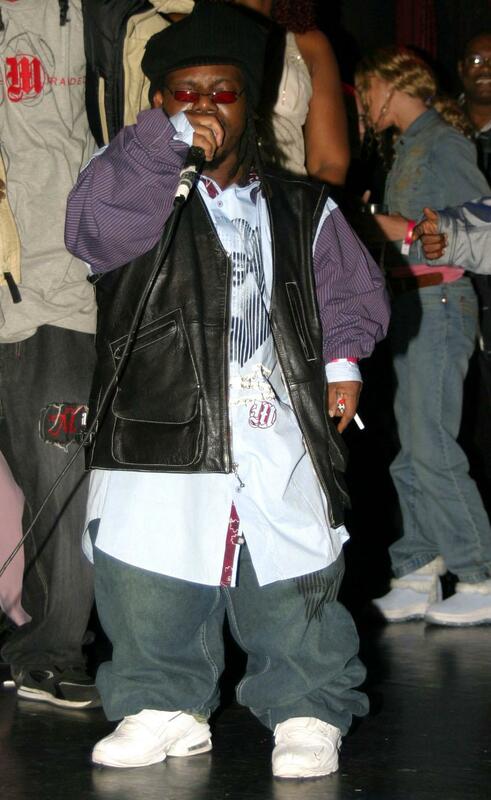 The Jamaican born Bushwick Bill, whose real name is Dr. Wolfgang Von Bushwickin the Barbarian Mother Funky Stay High Dollar Billstir, has had a checkered past that included being shot in the eye by his girlfriend, nearly being deported for a drug arrest, and penning the script to Superbabies: Baby Geniuses II. He had all but disappeared from the public eye after a short tenure as the backup point guard for the Sacramento Kings during the 2008-09 season. According to a source close to the band, it was about this time that Bill devised his plan to start the band Ghost. Few people suspected the diminutive 3 foot 8 rapper of being the singer from Ghost because of his strongly held religious beliefs. Bill became a born-again Christian back in 2006. 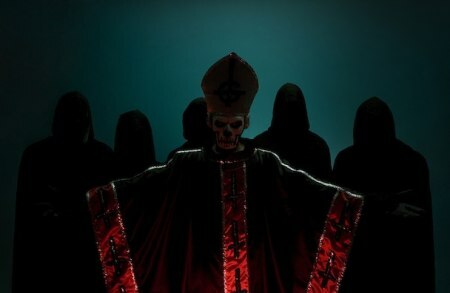 Ghost’s over-the-top satanic imagery and hedonistic lyrics seemed a poor match for the rapper’s monastic lifestyle. Credible press reports had even surfaced that several other people were Papa Emeritus including actor Jonah Hill, former Knicks Center Patrick Ewing and Def Leppard drummer Rick Allen. 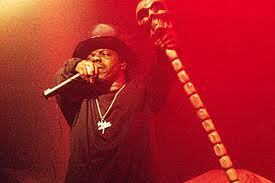 However, these reports were fabrications created by the band in order to throw the press off of Bushwick Bill’s trail. A wise man once told me not to pay for what you can get for free. He’s currently doing a stretch of 2 to 5 years at Rikers Island for passing bad checks, but his point was well taken. After my ticket for Saturday night’s Ghost, Opeth, Mastodon show at The Masquearde in balmy Atlanta, Georgia fell through, I was faced with two possible futures. One involved me jumping in my car, heading over to The Varsity and drowing my sorrows in 12 pimento cheese sandwiches and the other involved me standing out in the parking lot and craning my neck around some light poles to get a glimpse of Ghost, the current greatest band in the history of the universe. The choice was obvious. Metal Kid #1: Why is the singer of Mastodon wearing a Pope hat? Metal Kid #2: I don’t think that’s Mastodon. That’s probably Opeth. Me: No….that’s Ghost. Ever heard of them? Both Kids at Once: No???? Me: They are completely crazy. Keep watching. You’ll see some terrible things. Metal Kid #2: What do you mean? Me: Well, first of all, you know where he got that hat from? Me: He stole it from the real Pope. Metal Kid #1: No….No way! Is that true?!?! Me: Oh yeah. These guys are pure evil. The drummer punched the Pope one time at an IKEA in Munich and the singer took the hat and ran. They mugged the Pope for Godsakes! They were supposed to play America a year ago but they were banned from the United States. Metal Kid #2: Whoa! What for? Me: They are into trafficking and selling animal organs. The singer got caught trying to sneak 150 sheep livers into his suitcase when they went through customs. It was a big international incident. That and the whole thing with the walrus got them into a bunch of trouble…. Metal Kid #1: (horrified) Walrus??? What happened with the walrus??? Me: Jesus, doesn’t anyone read the newspaper anymore!!!! They did a concert in Poland and at the end of the show they brought a walrus on stage and beat it to death with hammers. They cut it up and gave pieces to everyone in the audience. It was unbelievable. They put birthday candles in each of the pieces! People ate it completely raw and something like 46 people died of food poisoning. Horrible! That’s what got them on the FBI’s 12 Most Wanted List. Metal Kid #2: Oh my god! Wow! These guys are awesome! Metal Kid #1: Do you think they’ll kill a walrus tonight? Me: God no! They found religion and recently became Jehovah’s Witnesses. They swore off all of that praising Satan and slaughtering animal stuff and now they go door to door preaching The Word. The guitarist, the one dressed like a Jawa from Star Wars, he sold me a copy of Watchtower magazine last month. Metal Kid #1: Whoa!!!! That’s amazing! I quickly tired of filling the minds of these kids with insidious poison and began to focus my attention onto the mellifluous tones of Ghost. The solo from Ritual was casacading to its nearly perfect peak when I became aware of a terrible presence only inches from my right arm. As the song ended, I turned and came face to face with The Hipster With the Glass Eye. The fella was probably six foot three and 98 pounds soaking wet. Imagine your average beardo coffee shop barista decked out in his best Piggly Wiggly tee-shirt and you’ve basically got a mental image of the dude I was looking at. Except this person had a glass eye. I couldn’t stop thinking about it. Did he have some terrible accident Vespa racing? Was this some kind of sadistic, post-ironic fashion statement? Did he pull the original eye out in frustration when he couldn’t find a copy of the new Band of Horses album? Do they sell glass eyes at Urban Outfitters now? This rare specimen of humanity had my interest for a full two minutes worth of conversation. Then, things got ugly. Me: Nobody knows who Ghost is. They’ve only done two interviews. Both of them were in caves. The interviewers were blindfolded and driven hours away to a secure location. They did the interviews wearing hoods! Hipster With The Glass Eye: So, no one knows who they are? Hipster With The Glass Eye: (excitedly) Wow, so they are kinda like Banksy??? That’s awesome! I looked away and shook my head in horror. An uncomfortable, awkward silence fell over us both. He stood there waiting for a response that would never come. I decided that the night was officially over. I walked to my car filled with hopelessness and despair. At least the band was good. National News Coverage of Sarah Palin and Oystergate!!! Click here for up to the minute coverage of Sarah Palin and the Oystergate scandal!!! Bloomington, MN (API)-In a bizarre scandal that is being called “Oystergate”, Sarah Palin is being accused of having a deep hatred of Swedish people. 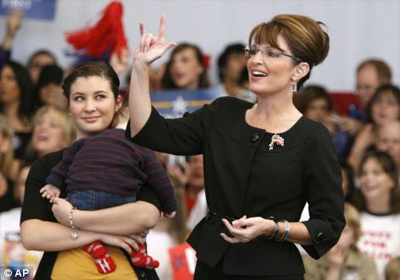 This story began when Palin agreed to write a music interview on a small website called “The Tyranny of Tradition”. Palin’s review, in which she shared her feelings about music including a love for the rock group The Blue Oyster Cult, started off as a simple discussion of heavy metal and quickly turned into an anti-Swedish diatribe where she claimed to be concerned about “slick talking Swedish terrorists” and referred to the government of Sweden as being “brutal and oppressive”. In a follow-up email, Palin added fuel to the fire by misquoting William Shakespeare and saying that there was “something rotten in the state of Sweden”. Blomquist also claims that, as a sick joke, she was regularly pelted with Swedish fish and subjected to mocking anti-Swede insults by Mrs. Palin and her husband Todd. Swedish-Americans have taken to the streets to voice their outrage at Palin’s comments. A group of nearly 500 angry Swedes stood in front of the IKEA in Bloomington, Minnesota today carrying protest signs, shouting “Palin hates Swedes” and proudly singing the Swedish National Anthem. Hilmar Lindquist, head of the Swedes For America group, has demanded an apology. Until Palin apologizes, Lindquist and several of his followers have begun a 40 day lingonberry-only fast. The Most Amazing Thing That Has Ever Happened To Me….THANK YOU SARAH PALIN!!!! Thanks for offering me a chance to write a review for your blog. I have been quite busy recently but I took a few moments to put something together for you. Hope you like it. Over the last few years, many of you have gotten to know me as Sarah the candidate, or Sarah the Governor, or Sarah the Mother, but I want to take this opportunity to show you another side of me. Today, I want to introduce you to Sarah the Metalhead. A lot of people think of me as some kind of stuffed shirt who doesn’t know how to rock out. Nothing could be further from the truth. Todd and I are both huge fans of heavy metal. On one of our first dates, Todd took me to the nicest restaurant in Wasilla, a wonderful little Mexican place called El Taco that is owned by our close family friend Jerry O’Malley. To impress me, he hired the mariachi band to play the Blue Oyster Cult song “Astronomy”. At that moment, I knew I was in love. Of all metal and hard rock bands, I have always had a special place in my heart for the Blue Oyster Cult. I love them so much that I even tried to get Bristol and Piper’s Jazzercise instructor to use “Burnin’ For You” as part of their warm-up activities. When we were working on Sarah Palin’s America for TLC, we tried to film a sequence where we shot a moose with a rocket launcher from a moving chopper. To get ready to use this fine piece of military machinery, I listened to the Blue Oyster Cult’s song “Vengeance: The Pact”. Unfortunately, I missed the moose and the segment had to be cut, but that song really got me ready to go. I recently picked up a copy of a CD by a band named Ghost called “Opus Eponymous” that reminded me a lot of what’s great about the Blue Oyster Cult. The album is filled with great solos, sweeping choruses and driving riffs. When I first heard the song, “Ritual” I knew I was going to enjoy their sound. There are definitely other influences on this album as well. I noticed a lot of moments that reminded me of some of the work done by the great King Diamond on the early records by Mercyful Fate, particularly the song “Elizabeth”. 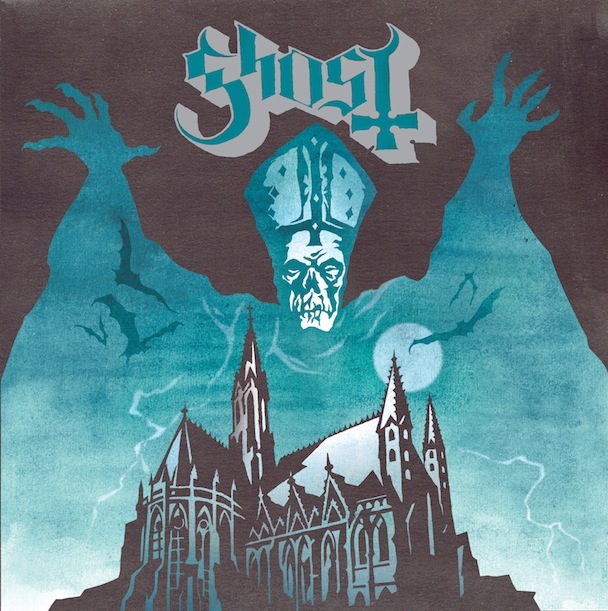 At first, I really loved the album but then I found out some things about Ghost that troubled me greatly. First of all, they make reference to Satan on several occasions on this album. There are also a lot of violent lyrics. As you know, I am strongly against young people listening to violent music. This is not the sort of thing that impressionable children should be listening to. The thing that disturbed even more was the fact that Ghost is Swedish. 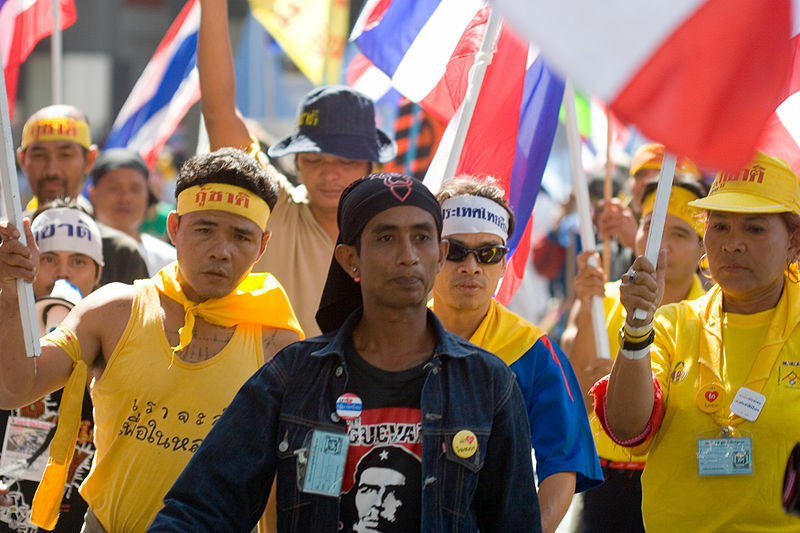 They seemed to speak English very well so I, of course, assumed that they were American. It makes you think that a Swede could pretend to be an American an easily get away with it. A slick talking Swedish terrorist could easily get past one of those TSA government workers and bring weapons of mass destruction into our country. I don’t want to paint all Swedes with the same brush. There are probably some good Swedes out there, but it is a fact that the government of Sweden is socialist. Ghost may not be a socialist band. They may have fled Sweden to escape their brutal and oppressive government, but they have grown up living the socialist life and these things can change a person. They probably would come here expecting some sort of government hand out if they didn’t sell enough records. We have to at least consider the possibility that their music is meant as a Trojan horse to lead our young people to violence, Satanism and the belief that the government is going to solve all of their problems. I would advise you to not buy this album in spite of the excellent quality of the music. There are plenty of good old fashion, red-blooded American metal bands that are struggling to sell records. Why give good hard earned, American money to a group of people who are just going to give it away to people who don’t share our values? Read Sarah Palin’s response to the “Oystergate” controversy caused by this article.